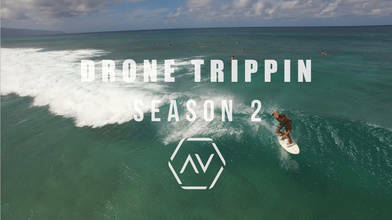 The second season of Drone Trippin takes place in Oahu, the site of the Drone Worlds held there in October, 2016. In this episode, Colby Curtola, aka SFPV, is able to sneak away to Oahu’s North Shore after finishing his racing events for the day. At the beach, he runs into pro surfers Eli Olson and Kailani Jabour, and they decide to try teaming up and mixing their skills to get some killer shots via an FPV quad in one of the world's top surfing locations. Description: The quads are back in action on Season 2 of Drone Trippin! This season, a world-class crew of FPV pilots headlined by ZoeFPV, JohnnyFPV, SFPV, and FlyingBearFPV heads to Oahu, Hawaii to shred the island’s beautiful coastline, breathtaking cliffs, epic beach parks, and abandoned structures in between competition at the World Drone Racing Championships. Episode 1: Shreddin the Shore finds the pilots wrapped up in qualifiers at Drone Worlds…except for Colby Curtola, who’s able to sneak away to Oahu’s North Shore after finishing his events for the day. At the beach, he runs into pro surfers Eli Olson and Kailani Jabour, and they decide to try teaming up and mixing their skills to get some killer surf shots. Can’t wait until Episode 2 for more freestyle and racing action? Get your FPV fix, along with special edits and personal content from your Drone Trippin crew, ZoeFPV, JohnnyFPV, SFPV, and FlyingBearFPV on their personal AirVuz pages! Or re-live all of Drone Trippin Season 1 on the Drone Trippin homepage. Circles / Lensko https://soundcloud.com/lensko VIDEO TRANSCRIPT: Angie Avestruz:	Oahu, Hawaii is known as the gathering place , which works since all of the world's best FPB drone pilots are gathered at the island's Kualoa ranch for the World Drone Racing Championships. All of them except Airview's pilot, Colby [00:00:30] Curtola, SFPB. His races are finished for the day and now he's got the day off. And what better day to spend the day off in Hawaii than by hitting the beach. I'm Angie Avestruz. Welcome to Drone Trippin. Colby Curtola:	[00:01:00] Oh, not in the sand. Oh, that's not good. Speaker 3:	No, that was amazing. Colby Curtola:	I was trying to land in the grass man, [00:01:30] but ... Speaker 3:	What IS that thing? Oh, it's [inaudible 00:01:32] shark? Colby Curtola:	Oh, it's FPB goggles. Speaker 4:	You dropped in and bottom [inaudible 00:01:37]. Colby Curtola:	Yeah, that was good. Let's try to get a couple more shots. Angie Avestruz:	Well, first time out there. What were the challenges you were facing? Colby Curtola:	As soon as I turn down wind, it's gone but I can use some cool moves into the wave so it's just like a wall. Angie Avestruz:	Yeah. You ever freestyled at a location like that? Colby Curtola:	No. This is the most fun I've ever flown in, probably. It's really gusty right now. It's not like constant wind, [00:02:00] so it's kinda scary if I get too low to the water. Angie Avestruz:	What's your biggest concern out here? Colby Curtola:	Shark eating my drone. Angie Avestruz:	While Colby was busy cleaning the sand out of his motors, I chatted up a few locals on the beach and we decided to try mixing their carving in a surf with Colby's shredding in the sky. Colby, we made it to the north shore and we ran into two local professional surfers. Have you guys ever had a drone film you while you've been surfing? Eli Olson:	Yeah, but not like the race drone, the bigger one. Colby Curtola:	I think what were gonna do is we're gonna have your buddy spot for you guys. Give [00:02:30] me a heads up when you're about to catch a wave. I'm gonna take off, come down and try to catch you kinda in the middle when the wave breaks. Eli Olson:	The thing about surfing is this wave, you can surf it a thousand times. Every single wave's gonna be different, so you can't really call what you're gonna do in advance. Angie Avestruz:	How are the waves looking for you guys? Kailani Jabour:	I love to do every maneuver in surfing. I love to do a carve, or an air or get barreled. So basically, whatever the wave offers is good to me. Eli Olson:	It's pretty average today but it's always fun. Colby Curtola:	You guys freestyle. [00:03:00] I'll freestyle, and we'll get something good. Eli Olson:	Sounds good to me. Colby Curtola:	As soon [00:03:30] as I turn down wind, it's like gone. This is really hard to find them. Angie Avestruz:	Well, you got a spotter here to help you out. Ryan De Seixas:	Cause they're sitting kinda deeper, most of them. So. Colby Curtola:	And it's usually only one guy on the wave. Ryan De Seixas:	Yeah. So this is like ... See, Kailani is not this guy on the way but he's gonna get a wave soon. Colby Curtola:	Okay, I'm ready to go. [00:04:00] I'm so scared. Ryan De Seixas:	So, Kailani's right there out idling for this one. Oh, nah. It closed out. Colby Curtola:	Alright, I'm gonna try to stay up in the air. Ryan De Seixas:	So, Kailani's paddling back out right now. Colby Curtola:	Okay. Ryan De Seixas:	Eli might get this one. I'll let you know. Yeah, he's paddling for it right now. Colby Curtola:	That's dope. That's sick. Ryan De Seixas:	Here's Kailani right here [00:04:30] on this wave. Angie Avestruz:	That is, right there on the yellow board? Ryan De Seixas:	Yeah. Angie Avestruz:	That he's going for so long? I know nothing about surfing. That was really impressive to me. Colby Curtola:	That was dope. Ryan De Seixas:	Probably gonna try to do an air on this section. Colby Curtola:	[00:05:00] He just juiced that little wave. Angie Avestruz:	Alright, you're on your last battery. Anything you're gonna try different out there now? Colby Curtola:	I'm just gonna try to get one more shot frame, see if I can add some freestyle into that. When I turn to the wind, it's like a wall. I'm gonna try to kinda hover into the wind and then just try to fly through it and keep up with them. This is really [00:05:30] a game-changer though for surf videos. No one's ever done this- Ryan De Seixas:	With FPB? Colby Curtola:	Yeah. Ryan De Seixas:	Oh, I haven't seen it done either. Those kind of drones don't exist here. No one's really doing it, you know? Colby Curtola:	Just the shots you can get. Angie Avestruz:	Is there any one shot you think you got that you're definitely looking forward to looking at? Colby Curtola:	I think I was following Eli. Ryan De Seixas:	That one looked cool. Colby Curtola:	I was right [00:06:00] behind him and I popped up ahead of him, did a back flip, and came right down on top of him, so I got the corral reef in the background. I think that was the first time anyone's ever shot surging with a FBP drone in Hawaii. I think it went pretty well. I got some good chase shots of both these guys, a couple of other guys out there. Kailani Jabour:	So crazy how fast that thing goes. I just see a thing back flipping about the wave all of a sudden. Everyone out there was kinda tripping out. Angie Avestruz:	Think there can be a future there? Kailani Jabour:	I feel like they could rig it up when they could follow us through the barrel, but it'd be very challenging. Eli Olson:	Because it's definitely small enough where it could fit in there with us but it would [00:06:30] be really hard to film and see where you're going. Angie Avestruz:	Is there anything super challenging you were surprised to face out there? Colby Curtola:	What I've learned from today is that there's a lot of chance that goes into surfing so timing the right shot and framing it has been a real challenge. Having a spotter helped a lot. Kailani Jabour:	They should put some built-in speakers so that way, when you're sitting out there, instead of hearing the insect noise, you hear some music. Colby Curtola:	Well, thanks for letting us come out. Eli Olson:	Oh, yeah. Thanks for filming. We appreciate it. Kailani Jabour:	Ah, Aloha. Angie Avestruz:	On the next episode of Drone Trippin. Colby Curtola:	We are helping to [00:07:00] the Botanical Gardens but hitting some spots on the way. Angie Avestruz:	Right here. See these palm trees to the right? Colby Curtola:	We can dive down that? Oh, man. It's a little sketchy but might be worth it.